Pasta salad is a go-to recipe whenever we are invited to summer picnics, or plan a kayaking trip. It is a crowd pleaser, it travels well, and best of all you can make it in advance! This is a new recipe we put together this morning, including the dressing. Making your own dressing is so much better than store bought and it is really simple! 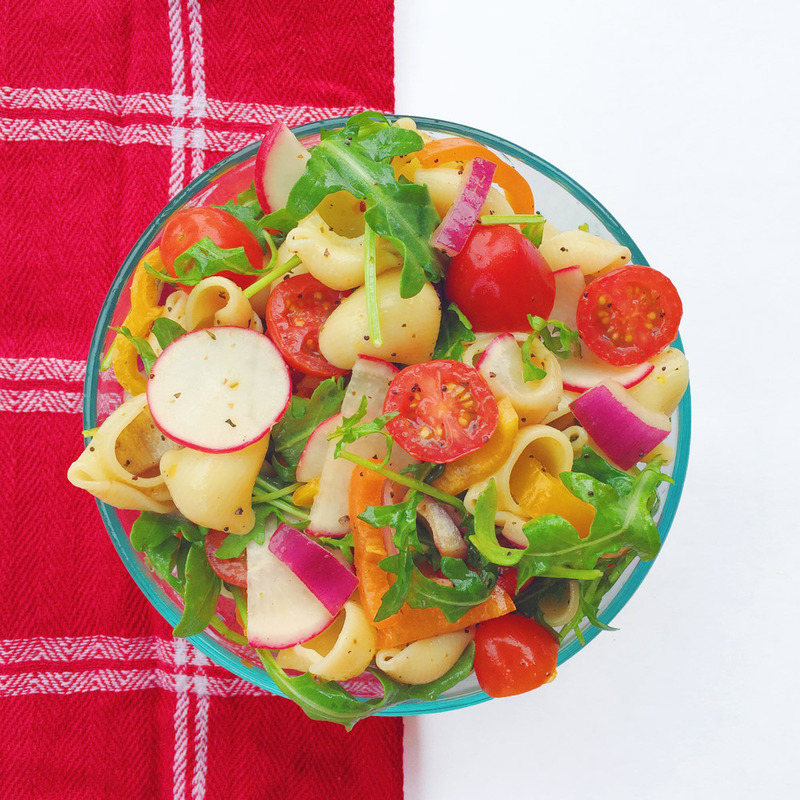 This is the first time we’ve put arugula in a pasta salad and we are so glad we tried it! It creates a crunchy contrast to the pasta and pairs well with the other raw vegetables. Pasta salads are so versatile and rarely made the same way. We would love to hear your go-to pasta ingredients or what additions you make to this recipe. 1 a box of your favorite pasta, such as bow tie, penne, fusilli, etc. Bring a large pot of heavily salted water to a boil and cook the pasta according to package directions. Drain the pasta and set aside to cool. While the pasta is cooling, cut the vegetables and toss them together in a large mixing bowl but leave the arugula separate. When the pasta is room temperature or cooler, mix it with the vegetables. In a small bowl whisk together the ingredients for the dressing. Once it is completely mixed, add half of it to the pasta and vegetables. Mix the pasta salad to evenly distribute the dressing. Continue adding the dressing slowly until you have the correct amount. This pasta can be made the night before and stored in the fridge. We think it tastes better when it sits overnight. The pasta may absorb some of the dressing so you may have to add a little more the next day. Toss in the arugula immediately before serving as it will wilt if it sits in the dressing overnight.